The HoofWraps team joined up with the leader in gel technology and developed a pad specifically for hoof care with horses. It absorbs shock and provides comfort and support where your horse needs it most. Hoof Wraps takes the hard work out of hoof care. Imagine for a moment you’ve had a vigorous day working and your feet are aching and sore! Fortunately, someone thought to purchase you a soft, cool gel pad you can slip in your boot and continue on! Your foot sinks into the gel pad and the pain suddenly fades away! Now your horse can have one too! The HoofWraps team teamed up with the leader in gel technology and developed a pad specifically for hoof care with horses. It absorbs shock and provides comfort and support where your horse needs it most. Taking the Hoof Wraps Gel Pads to the next level, we have infused them with Jojobba and Tea Tree oils. Each of these natural oils has been used for centuries for fighting bacteria! Now you can let Mother Nature sooth your horses’ hoof as these oils are slowly released to combat bacterial growth! 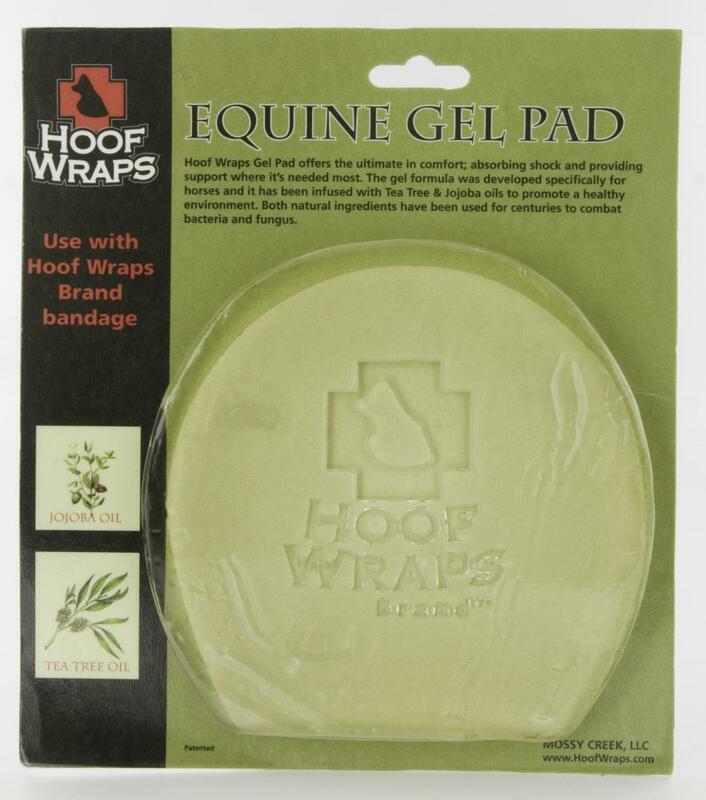 These Gel Pads are designed to use with the HoofWraps Equine Bandage - Hoof Wraps is a multi-use, multi-purpose bandage for everyday horse hoof care and protection. Easily treat common hoof problems like horse hoof abscess, thrush and stone bruise, or use for protection after shoe loss. They're designed specifically for horses on turn out so your horse can still enjoy the freedom of mobility during treatment.